Telemetry-based fish tagging: This STIS is being designed for the recently initiated acoustic telemetry-tagging project on Lake Pontchartrain. The project will collect real-time data on the movement of individual Speckled Trout and the associated environmental data. The planned STIS will enable the study of seasonal migration patterns of Speckle Trout in Lake Pontchartrain. During the project's second phase, an extension to include more fish species and basins is expected. 1) Environmental data for the observed fish time. 2) The selected fish tracks that are currently being observed. 3) Visual controls for viewing the selected tracks. Traditional fish tagging: The tradition fish tagging effort is a voluntary program aimed at a better understanding of the movement patterns and habitat use of targeted fish species. 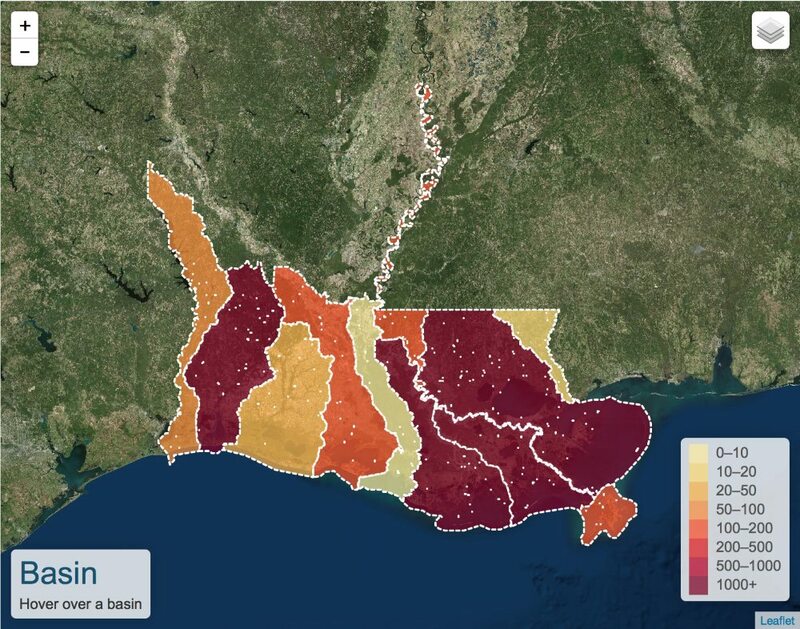 This STIS includes a geospatial portal that enables LDWF to perform data entry, content management and report generation. The portal enables anglers to perform on-line submission and manage their own captures/recaptures. Submission can also be performed via mobile app while the angler is still on the water. Louisiana Recreational Creel Survey (LA Creel): This is a state-of-the-art real-time STIS that will enable Red Snapper quota monitoring to insure a sustainable fishing of this specie in the coast of Louisiana. Recreational Offshore Landing Permit Site (ROLP): This public web portal serves as the state's central access point for registering, viewing, and renewing LDWF recreational/charter fishing permits at no cost to the user. Rodeo: This service at geauxfishlarodeo.com offers a full suite of rodeo event management, including team registration, live-updating leaderboards, SMS notifications, as well as capture entry and analysis.